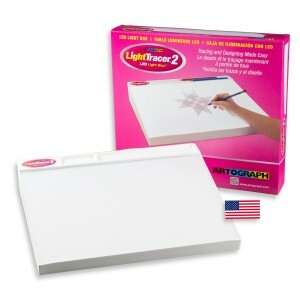 Features a 10 x 12 inch (254 x 304.8 mm) conveniently slanted tracing surface and handy recessed tool tray to keep pencils, chalk, embossing stylus, and other tracing tools at your fingertips. Illuminated by a long-life “daylight” 8-Watt fluorescent lamp (included). Uniform lighting prevents hot spots. Electrically operated product. Adult supervision is required. Ages 15 and up. This entry was posted in Light Boxes, Light Tracer and tagged light box, light boxes, Light Tracer, LightTracer, LightTracer light box, Tracing Box, Tracing Boxes on April 5, 2014 by Artograph. The LightPad’s® sleek, contemporary design makes it more user-friendly than ever. Advanced Super Bright LED technology allows the LightPad® Series to shine brighter, run cooler and use less energy—providing up to 50,000 hours of maintenance free creative brilliance. This entry was posted in Light Boxes, LightPad Series and tagged LED light box, light box, light boxes, Light Tracer, LightPad, LightPad 950, Tracing Box, Tracing Boxes on April 5, 2014 by Artograph. The LightPad’s® sleek, contemporary design makes it more user-friendly than ever. Advanced Super Bright LED technology allows the LightPad Series to shine brighter, run cooler and use less energy—providing up to 50,000 hours of maintenance free creative brilliance. This entry was posted in Light Boxes, LightPad Series and tagged LED light box, light box, light boxes, Light Tracer, LightPad, LightPad 940, Tracing Box, Tracing Boxes on April 5, 2014 by Artograph. The LightPad’s® sleek, contemporary design makes it more user-friendly than ever. Advanced Super Bright LED technology allows the LightPad® Series Light Boxes to shine brighter, run cooler and use less energy—providing up to 50,000 hours of maintenance free creative brilliance. This entry was posted in Light Boxes, LightPad Series and tagged LED light box, light box, light boxes, Light Tracer, LightPad, LightPad 930, Tracing Box, Tracing Boxes on April 5, 2014 by Artograph. The LightPad’s® sleek, contemporary design makes it more user-friendly than ever. Advanced Super-Bright LED technology allows the LightPad® Series to shine brighter, run cooler and use less energy—providing up to 50,000 hours of maintenance free creative brilliance. This entry was posted in Light Boxes, LightPad Series and tagged LED light box, light box, light boxes, Light Tracer, LightPad, LightPad 920, Tracing Box, Tracing Boxes on March 31, 2014 by Artograph.